Part of Yinka Shonibare’s large scale series, Diary of a Victorian Dandy is one of more than 50 photographs exploring the experiences of black people in Britain in the latter half of the 20th century which feature in the V&A’s new exhibition, Staying Power: Photographs of Black British Experience 1950s-1990s. 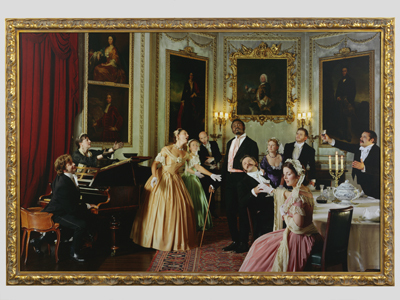 The photographs have been selected from 118 works by 17 artists which the South Kensington museum – working in partnership with Black Cultural Archives – has acquired over the last seven years in a project funded by the Heritage Lottery Fund. Along with Shonibare’s 1998 series, others on display include intimate portrayals of British-Caribbean life in London in the 1960s-70s by Neil Kenlock, Armet Francis, Dennis Morris and Charlie Phillips along with Raphael Albert’s depictions of the black beauty pageants he organised from the 1960s to the 1980s, and Norman ‘Normski’ Anderson’s colourful depictions of vibrant youth culture of the 1980s and Nineties. The display is accompanied by oral histories on a range of subjects – including recollections of the photographers, their relatives, and the people depicted in the images – which have been collated by Black Cultural Archives. Runs until 24th May in gallery 38A (admission is free) Coinciding with the exhibition, the BCA is presenting a display of 25 more photographs drawn from the V&A’s collection at their heritage centre in Brixton (runs until 30th June; admission is free). For more, see www.vam.ac.uk/stayingpower (and for the Brixton exhibition, see www.bcaheritage.org.uk) PICTURE: © Yinka Shonibare/Victoria and Albert, London.